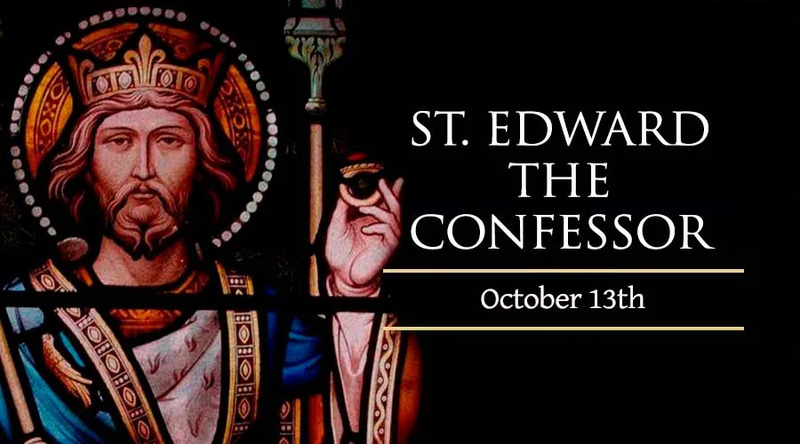 St. Edward was born in 1003 as the son of the Duke of Normandy and nephew of King Edmund Ironside of England. He grew up in exile in Normandy from the age of 10 when the Danes gained control of England, and the early experience of loss, coupled with his earnest religious piety, caused him to renounce worldly ambition and devote himself to the love of God. On the death of the Danish king, Canute, in 1042, he was called to the throne of England, which he accepted dutifully and held until 1066. His saintly bearing made him a popular sovereign, and his actions even more so. He abolished an unjust tax and was known to cure people with his touch. Having made a vow of chastity, he accepted marriage for the sake of his kingdom, but lived with his queen in celibacy, as brother and sister. Unable to fulfill a vow to embark on a pilgrimage to Saint Peter’s tomb without leaving his subjects vulnerable to attack, his vow was commuted by the pope to the rebuilding of Saint Peter’s Abbey in Westminister, where he was buried upon his death a week after it’s dedication. Edward died on January 5, 1066, and was canonized by Pope Alexander III in 1161.